Rumor: A struggling newborn improved dramatically after being placed in an incubator with her healthy twin sister. Claim: A struggling newborn improved dramatically after being placed in an incubator with her healthy twin sister. 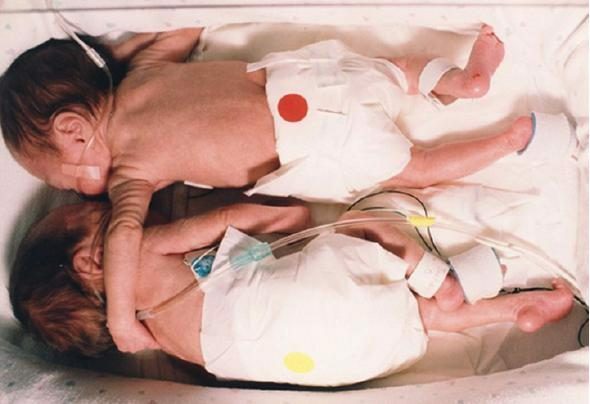 This is a picture from an article called “The Rescuing Hug.” The article details the first week of life of a set of twins. Apparently, each were in their respective incubators, and one was not expected to live. A hospital nurse fought against hospital rules and placed the babies in one incubator. When they were placed together the healthier of the two threw an arm over her sister in a endearing embrace. The smaller baby’s heart rate stabilized and her temperature rose to normal. Origins: This touching story about the healing power of sibling love made its appearance on the Internet in April 2000. As glurgeriffic as it sounds, the item referenced above is a true story, at least in its broad strokes. Although it’s impossible to say whether Brielle’s recovery was wholly or primarily due to the healing touch of her twin sister, she did improve considerably after Kyrie was placed in the incubator with her. The children survived their rocky beginning and in time went home with their mother and father, but the media attention brought about by their story and the now-famous photograph prompted their parents, Heidi and Paul Jackson of Westminster, to change their telephone number. And famous that photo became. Besides being circulated on the Internet, it has run in Life magazine and Reader’s Digest. The photo was taken by Chris Christo of the Worcester Telegram & Gazette. Another method used to stabilize preemies is “kangaroo care,” a term for prolonged skin-to-skin contact with parents and other caregivers. The technique, so named because of its resemblance to the way pouched animals care for their young, involves skin-to-skin contact between parent and baby. Often the child, wearing only a diaper and covered by a blanket, is placed against the parent’s bare chest. The method is especially effective with premature babies, who are extremely fragile and have almost tissue-thin skin when born. Proponents say the method can have amazing effects: a steadier heart rate, better breathing, greater contentment, deeper sleep.